Carpet-weaving is one of the most significant and ancient forms of Azerbaijani crafts representing the history, culture and traditions, which were carefully preserved and passed on from generation to generation. 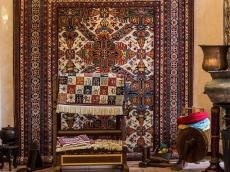 The territory of Azerbaijan has seen different states, religions and tribal cultures coming and going with all these processes being reflected in carpet making. In general, there are several schools of carpet weaving in Azerbaijan, each with its own specific style. There are different patterns and color palette of several schools, including Guba, Baku, Shirvan, Ganja, Gazakh, Karabakh and Tabriz. Some of these schools are known for their inherently complex geometric patterns that represent conceptual bodies of men and animals, while others are characteristic of diverse floral decorations with abundant variations reflecting flower-shaped motifs. About 600 kinds of designs decorate Azerbaijani carpets. The most-used design in the national carpets is Buta, which has 72 kinds of shape and three main meanings including fire, water and cypress. The most enchanting and vivid carpets were created by Karabakh school. Presumably, carpets in the territory of Karabakh have been woven since the 15th and 16th centuries while carpet making itself appeared in Azerbaijan much earlier - approximately in the 10th-11th centuries. Karabakh carpets are regionally divided into three groups including the Aran group, the Shusha group and the Jabrayil group. In the 18th century, Karabakh carpet weaving was concentrated in the city of Shusha. In those days, Karabakh has already been famous for its carpets. Favorable geographical position, sheep breeding and abundance of wool, as well as great demand for woolen hand carpets were the main reasons for involving the population of Karabakh in carpet weaving. Karabakh carpets fascinate with their colors and geometric patterns. The main motifs found on these carpets are divided into five groups: buta, kataba, ana gul, gol and khoncha, gubba. Buta is one of the most widely used patterns both on lint-free and pile carpets. A kataba or kartush was used as a filling element. Various inscriptions, plot scenes or individual patterns were woven on the oblong kartush. Ana Gul is another important element while Gol and khoncha (large and small medallions) are also often woven in Karabakh carpets. Gubba is a suspension placed on the ends of the central medallions. There are 33 compositions of Karabakh carpets, which stand out for their colorfulness and brightness. According to the traits of local sheep wool Karabakh carpets have long tight and mild pile. Aran, Bagchadaguller, Bal?g, Buynuz, Barda, Bahmanli, Garabag, Goja, Gas?mushag?, Lambaran, Mugan, Tal?sh, Lampa, Mal?bayli, Khangarvand, Khanl?g, Khantirma, Chalabi, and Shabal?dbuta represent the classical patterns of Karabakh carpet-weaving school. Karabakh carpets have the richest color palette, which reflects the subtlest shades of the colors of the region's nature. Traditionally, the background in the intermediate sections of the Azerbaijani carpets are filled with red paint. Geometrized forms of plant motifs and a colorful gamut of color combinations make the Karabakh carpets original. The motifs of the Karabakh carpets have no equal in their artistic value and originality of the image. If earlier, in addition to beautiful images, the hunting plot was the basis for these carpets, later a clear decrease in the interest to the hunting plot can be observed. In the first quarter of the 20th century, hunting completely disappears as a theme, giving way to images of animals. At the end of the 19th century “atli-itli” (horse-dog), “itli-pisikli”(dog-cat), “maralli-jeyranli”(deer-gazelle) and other fleecy carpets were weaved. In composition terms, these carpets depict horizontally arranged images of animals. A number of carpets devoted to Rustam from Firdovsi‘s “Shahname”, famous with their composition principles and national spirit, were created by Karabakh school of carpet-weaving. Azerbaijani carpet - ancient, magical, full of symbols and secrets - may be studied for years, but still remain unfamiliar, revealing more and more new riddles.